Exit planning and business broker firms predicted millions of companies would flood the market as baby boomers focused on retirement. These companies were projected to hit the market starting in 2011, the first year baby boomers reached the age of 65. Four years later, these predictions prove to be overly optimistic and the anticipated consequences have not happened. U.S. Census Bureau data indicates baby boomers own about two-thirds of businesses with employees in the U.S. - about 4 million companies. Theoretically, if an equal number of boomer business owners attempt to sell their companies each year as boomers turn 65, 210,000 businesses would hit the market each year until 2030. This predicted "tsunami" of businesses for sale relied on the law of supply and demand to suggest business valuations would plummet and be difficult to sell. Owners were advised to sell fast before the value of their business, and the majority of their net worth, collapsed. While the number of sellers has increased since 2011, the number of completed sales is climbing at an even faster rate. PitchBook, a private capital market research firm, analyzes the number of announced deals in the lower middle market - a deal size of $10 million to $100 million. In 2015, the number of completed transactions was 70 percent more than 2010. "I don't subscribe to the idea that a flood of companies looking to sell will struggle to find buyers due to oversupply. A company's ability to sell will depend on its own fundamentals," said PitchBook analyst Daniel Cook. Since the financial crisis, median M&A valuations for deals under $100 million have hovered around $15 million. "Despite a large increase in sellers in the market, valuations have remained steady, even increasing 4 percent in 2015," said Cook. "This increase is even more profound when you remove oil and gas transactions from the equation, with median 2015 valuations increasing 6 percent from their 2014 levels." Similar to the lower middle market, the number of small businesses for sale is trending up. These businesses, most of which have one to 10 employees, likely put their selling plans on hold during the recession, which created a pent up group of sellers who decided to enter the market as the economy and their business improved. "We are not seeing a tsunami yet, but we are definitely seeing a rising tide with an increase in new listings of about 20 percent since the recession," said Bob House, group general manager of BizBuySell.com, an online marketplace for small business sale listings. "The median asking price is up 12 percent and the median selling price is up 8 percent from 2014 to 2015. The number one reason for selling in our space continues to be retirement." 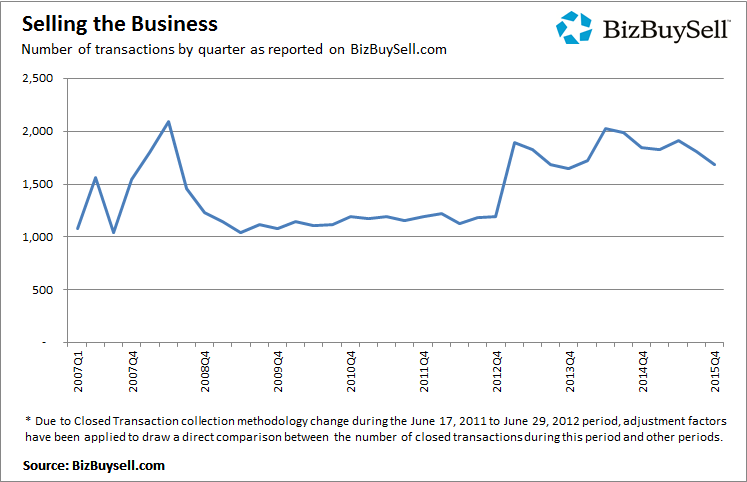 The number of small business sales reported by BizBuySell.com has remained much higher for the last three years, almost reaching the peak level of early 2008, before the recession started. What about the tidal wave and lower valuations? Multiple factors explain why the tidal wave of sellers and the commensurate decline in business valuations has not happened, and may not happen at all. According to John Zayac, Managing Partner of IBG Business "low stock market returns, low cost of money and abundance in un-deployed funds continue to drive strong values for firms with solid growth opportunities, my concern is the fragile economy can change all of this in a week"
The predictions assumed the majority of the 4 million boomer businesses would enter the market in an attempt to sell to a third party. "About 70 percent of our members' clients do not choose to market their business to third party buyers," said John Brown, CEO of Denver-based BEI, a firm that provides resources to hundreds of exit planning firms in the U.S. and internationally. "In most cases, our clients transfer the business to their children or employees." Other owners realize they cannot sell their business and maintain their lifestyle. "It is very hard for most business owners to replace the income they derive from owning their business by investing the proceeds from the sale of the business," said Brown. "Right now, we find most financial planners are advising business owners to assume a three to four percent return on investment. Many owners earn far more running their business than they will earn by investing the sale proceeds from selling." According to Brown, "Our research indicates there are about 450,000 businesses with between 15 and 200 employees that could be sold. We estimate only about 200,000 companies are positioned so the owner can exit the business and have financial security today." Business owners do not think of retiring at 65. "We have not seen a business transition tidal wave of sellers; although, I expect the pace will accelerate over the next 10 years," said David Selig, CEO of Advice Dynamics Partners, a San Francisco-based company specializing in the sale of wealth management firms. The average age of his clients is 58. "About 90 percent of wealth management firms are unprepared for a transition or succession." "Many business owners I talk to do not have anything to retire on and lack a post work vision," said Selig. "Unfortunately, it often takes a catalyst like an illness, divorce or other catastrophic event before the owner will begin working with my firm on a sale process." Some businesses may not be not sellable. Buyers tend to shy away when a business is heavily reliant on the owner for success. Some buyers resolve this situation by requiring the owner to remain with the business for an extended period (three to five years). Owners often resist this approach, rendering their business un-sellable or worth much less. Buyers drive the market, especially during strong economic cycles. Public companies, large private enterprises and private equity rely on acquisitions to build their businesses. "Private equity buyers have nearly $540 billion to deploy, the highest level of dry powder seen since 2007," said Cook. "What's more, the S&P 500 companies have a record $2 trillion dollars in Cash and Equivalents on hand." "I think business owners should focus on building companies with sustainable competitive advantages and attractive growth prospects that will draw the interest of financial and strategic investors rather than worrying about the number of sellers in the market," said Brad Cornell, Partner at Excellere Partners, a leading private equity firm based in Denver. "A business with a strong customer value proposition, differentiated products and services, a diverse customer base and quality management, will always be in demand." IBG's professionals have provided merger and acquisition services to the US middle market since 1986. Their award winning M&A broker and advisor experts have an industry leading track record of 1,100 + successful transactions.